The subtitle of this transformational book is Healing Our Relationships, Coming to Ourselves and that is what this powerful self help book is all about, really - healing our relationships. I don't want to say too much about it (and spoil it for you) other than I genuinely believe it (at time of reading) to be the most illuminating (helpful) self-help book I've ever read - more important than Tolle's A New Earth (which really is saying a lot). 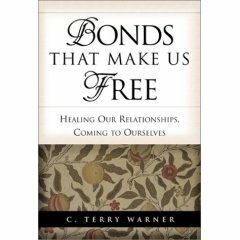 Your relationships will improve if you read this book and take on board what C Terry Warner has to say! And I'm not talking about casual relationships, here, but those long-term relationships with siblings or parents or even children where you have tried and tried and tried to make things better but failed. Warner's incredible book has the answer. Warning! It might not make comfortable reading. Brian basically said there was little point in getting back with your ex- if you were just going to repeat the same mistakes. So he recommended Warner's book as it helped you to take an honest, victim-free look at your relationships; it helped you to recognise the sometimes damaging role that you play in your damaged relationships. Having read C Terry Warner's Bonds That Make Us Free now, I couldn't agree more! I also feel the ideas presented in this book really get to the truth, not only of how to improve relationships, but also how to build sturdy and authentic feelings of self-worth. I read this book about 5-6 years ago and since then, have read the other books from this author and/or the Arbinger Institute (affiliated) and have attended workshops they've presented. I've also taught the principles through psycho-educational groups with max level male prison inmates. (I'm a therapist at the prison). The more I learned and taught and experienced, the more I fully believe in the principles this book espouses. I believe it's a powerful philosophy because it hits on truth and gets to the heart of issues. One of the most thought-shaking books I have ever read. I loved Bonds That Make Us Free and wish that it was a required read in college lit classes. I would recommend this book to anyone desiring to improve their relationships. I work in the family counseling field and have never read another book that provides such deep and applicable insight on the topic of personal and relational development. I have read it 3 times now and each time I have learned more.